I found this article and decided to share……. With rejection and shame, Igbo delegates to the just concluded APC National Convention in Abuja have arrived home. Like the North Central zone, the Igbos returned empty handed. 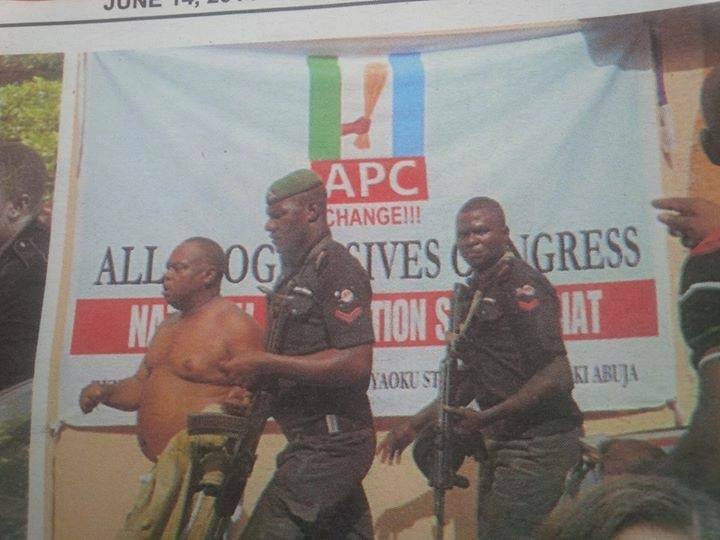 They went to Abuja, they were rejected, some were beaten-up by the agents of the oligarchs and this man in picture was not lucky.He was thoroughly beaten and stripped naked by APC thugs that were unleashed on Igbo delegates to ensure that they will not actively participate in the convention or contest the arrangement pre-determined by the Lords of the party. The biggest shame you will put to an Igbo person is stripping him or her naked in the public. That is why instead of these party men talking out their differences, our people were attacked like animals. Whatever their offense may be, they don’t deserve this. My worry and question is, Must Igbos always be a sacrificial lamb in any troubled situation in Nigeria? A Norwegian drew a cartoon of Prophet Mohammed, over 79 Igbos were killed by those we called our brothers. An American/Egyptian made a provocative film about Prophet Mohammed, 8 Igbos were gruesomely murdered in different cities in the North, for no reason. Israel attacks on Palestine, always result in killing or burning alive of Igbos across the country. Chris Ngige, a Senator of the Federal Republic of Nigeria and the Secretary of the APC convention was physically stopped from addressing the delegated, because some people thought he will use the chance to complain about the ill treatment of his people. He was saved by friends hours later, as some people wanted to beat him up in the convention. The lesson for these Igbos who have lost their ears, is that, “If you put a lipstick on a pig, it will still be a pig”. APC is formed by those that hate Igbos, and it is a monumental act of folly to sheepishly follow them, as their attitude towards us will never change. For those who refused to heed to this advise, this is just morning!!! ← Another Civil War In Nigeria Soon?